LCCC's 167-acre main campus is located in the center of Luzerne County Pennsylvania with 11 satellite campuses located throughout Northeastern Pennsylvania. At Luzerne County Community College, we offer a multitude of quality and unique liberal arts and technology programs. Please feel free to explore our web site and learn how LCCC can help you achieve your needs. WSFX-FM (89.1) was turned on by Luzerne County Community College in 1987 to serve the Nanticoke (Pa.) and surrounding area. A translator at 105.5 FM was added to fill in the west side of the Wyoming Valley in 1994. WSFX-FM combines curriculum responsibilities, extra curricular participants and student body volunteers to power its staff. 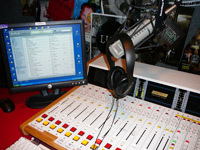 WSFX-FM is student run under the guidance of a faculty supervisor. Students and staff who are currently involved at LCCC are encouraged to work on air as DJ's or production creators. Alumni and community involvement are also encouraged to participate in music and public affairs programming. Students are provided with the tools and opportunities for "hands on learning" that promote confidence and skills for entry level jobs. Staff can obtain a solid base to continue their education beyond the Associates Degree in Broadcasting. WSFX-FM has won national radio production awards for special programming.